Staff at Nottingham-based home improvement company KLG Rutland will swap business suits for chef aprons as its showroom is transformed into a pop-up cafe to raise money for charity. KLG Rutland will host its drop-in Big Breakfast on the morning of Friday, March 31 – with the money raised going to Cancer Research UK, a charity which the company has raised thousands for over the last few years. Marketing director Terry Hill said: “This is the second year we have held this fundraising event. 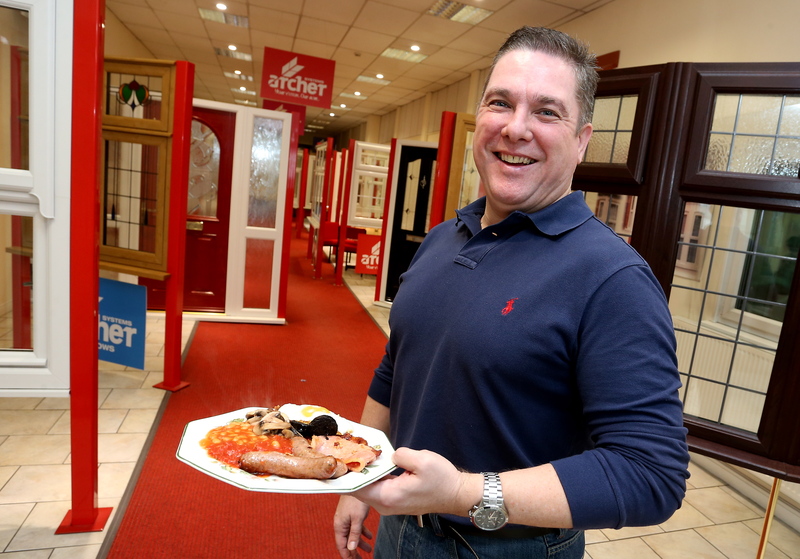 Once again KLG Rutland will transform its Beeston showroom into an extremely stylish pop-up cafe to cook and serve Big Breakfasts in aid of Cancer Research UK for customers, employees and suppliers. We’re hoping to attract as many hungry visitors as we can, with the smell of sizzling sausages, bacon and mushrooms helping to draw in passers-by. KLG Rutland, which also has an office in Ilkeston, supplies home improvement products including windows, doors, conservatories, fascias and soffits since. The company helped with a number of charity events for Cancer Research UK last year, including a family fun day at The White Lion, in Kimberley, which featured stalls, taster pamper sessions, raffles, tombola, BBQ and refreshments. In addition to its fundraising efforts, KLG Rutland can announce that it has extended its sponsorship with Hucknall and Linby Dolphins Swimming Club. This year, the company has decided to hold its first ever ‘KLG Rutland Trophy’, which will see one of the club’s coaches receive an accolade for Young Volunteer of the Year. Lisa Millett, Cancer Research UK spokesperson for Nottingham, said: “Cancer Research UK receives no Government funding for its research but with help from businesses like KLG Rutland the charity is fighting the disease on all fronts. “Cancer survival rates have doubled since the 1970s and Cancer Research UK’s work has been at the heart of that progress. Thanks to advances in research, more people are surviving cancer than ever before. The Big Breakfast event will take place from 8-12pm at KLG’s Beeston office on Queens Road East. Donations are welcome on a pay what you can basis. You can also donate online by visiting KLG’s Just Giving page https://www.justgiving.com/fundraising/KLGRutland2017. For more information contact Terry on 0115 9221155 or terry.hill@klg.co.uk.